The Zefal Trekking 700S is a decent capacity water bottle that's easy to use on the move. However it does have one problem: it doesn't quite empty. 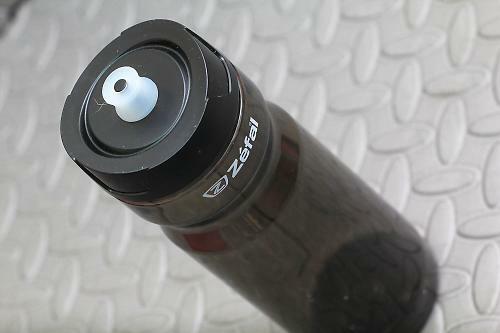 As far as water bottles go, the Zefal is fairly lightweight at 140g. It holds 700ml/24oz which is enough for a short ride, or double up with another bottle for a longer ride. The cap is a screw on with a soft mouthpiece. The soft top makes it easy on your teeth as you pull it up to drink and it feels pretty nice to drink out of. Water flows easily from it as long as it's pulled all the way up. If you don't, it feels like you are struggling to get the water out. It is constructed to fit the majority of bottle cages and fitted mine easily. It sat securely and never rattled around either. It was easy to grab on the move and put back in the cage too. Made from Tritan, the bottle claims to be odourless. I found this to be true and tried it with a variety of liquids from water to flavoured drinks. There was never any residual flavour from the previous drink. The bottle is very solid to feel and it has been dropped a few times by accident, and it is resilient. It's dishwasher safe too, so really easy to clean. It has a measurement level up the side so you can easily keep track of your fluid intake. It is also BPA free which seems to be standard now. The only real downside to this bottle is that the design of the cap doesn't allow the last mouthful to come out of the bottle. Of course this isn't a major concern, but annoying nonetheless. You have to unscrew it to empty it completely. Apart from this, it performs really well. The bottle is aimed at anyone doing sports and cyclists. Zefal say "Made in Tritan™, the Trekking 700 S has an integrated soft push for a better comfort. 100% without BPA, the Tritan™ material ensures durability and good taste of your drink. It's the ideal hydration product for daily consumption at work". I agree with the durability and it certainly is easy to use. The bottle is solid and well made. The bottle doesn't empty completely. The soft cap is really quite good to drink from. The bottle is reasonable for the price. The water bottle worked well for use on a bike. I liked the soft top on the bottle. I couldn't drain it completely without unscrewing the cap. Would you recommend the product to a friend? Yes, but I would tell them about the it not emptying completely. My GF has a version with a "flip" valve and a straw on the inside. She's just so happy with this product! It seems like once another Zefal have managed to provide a simple, but thoroughly thought out product at a decent price. One just shouldn't ask for more! "It is also BPA free which seems to be standard now". This is a red herring! Bisphenol A (BPA) is a hardening agent that was used in hard Polycarbonate (PC) bottles (baby bottles, rigid outdoor drinking flasks etc). Cycle bottles are produced using Polyethylene (PE) in High Desity (HDPE) Medium Density (MDPE) or Low Density (LDPE) and have no need for the BPA additive. Therefore any squeezy cycle bottles never have or never will use BPA additive. Following a baby bottle health scare in the USA a few years back BPA was removed from bottles made from PC and since then every manufacturer has clambered to stress that their bottles are BPA free when in fact in the case of cycle bottles BPA was never used in the first place!